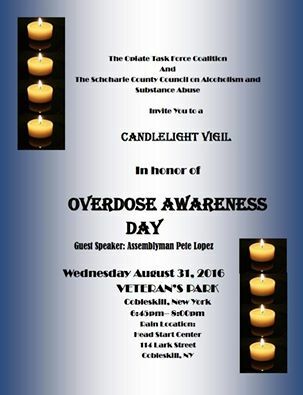 The Village of Cobleskill will be hosting a candlelight vigil for drug overdose awareness. The event will feature Assemblyman Peter Lopez as the guest speaker. The Opiate Task Force Coalition and the Schoharie County Council on Alcoholism and Substance Abuse are putting on the event, which will run from 6:45 to 8:00 pm. More information can be found on the Council's Facebook page.